Pom poms are one of those cutsie things everyone loves but no one is quite sure what to do with. Here is a fun and simple way to use pom pom trim to make a bright and colorful necklace. Ideal for a DIY gift or something to make for yourself, it takes only a few minutes to create this statement piece. The pom pom isn't just ornamentation -- it's the star of the show. To make your own pom pom necklace, you'll need: 10 inches pom pom ribbon, 10 inches rhinestone strand, 10 inches curb chain, separated (10 for the necklace, 1 for the clasp), 2 feet orange nylon cord, 12 jump rings, 2 eye pins, 2 end caps, 1 clasp, wire cutters, flat-nose pliers and permanent glue. Align the top of the pom pom ribbon with the length of the chain. Open your jump-rings and hook one end of the strand of pom-pom garland to one end of the chain. Close the jump-rings. Every four links, on the same edge of the chain, hook together the chain to the pom pom ribbon so the pom pom ribbon hangs from the chain in a flat manner. 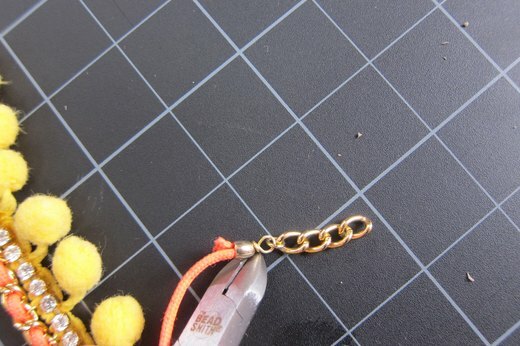 Remove the excess chain (1 inch). Save this for the clasp at the back of the necklace. Take your cord and weave it through the curb chain in an up and down pattern. The cord will look like an inch-worm wiggling up and over the joint of a flat chain. This will create a Chanel-esque look to the chain. Scoot it through until the chain is right in the middle of the length of the cord. Glue the strand of rhinestones to the bottom edge of the flat ribbon of the pom pom. Use your wire cutters to trim away any excess rhinestones. Load up the first head pin with the nylon cord 1/2 inch from the cut end, an end cap, and the clasp. Make a loop at the clasp's loop then wire-wrap right above the end cap. Trim excess wire. Load up the second end pin with the other end of the cord 1/2 inch from the end, the end cap, and the inch of chain. Make a loop with the wire, wrap once, then trim the excess with wire cutters. Once you've attached the end cap and the clasp, you're ready to show off your pom pom necklace!